Last week I wrote about My Terrible Experience with GitHub. I was a little emotional and may have said some things to GitHub Support that were childish - “I think YOU’RE a robot GitHub Support!” - but I was pretty upset about being excluded from such a powerful software community because I violated some unclear guidelines. Sorry for any confusion and inconvenience up to this point. We also apologize for the long delay: you raised some very interesting questions about our Pages policy, and we have been spending this time discussing it in depth. Your concerns are important to us, and I want to clarify our decision for you. 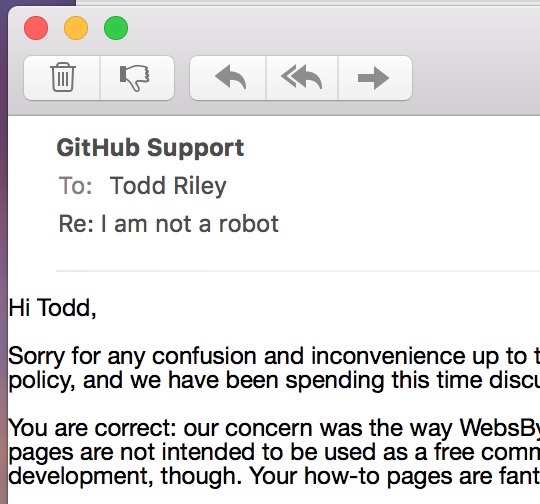 You are correct: our concern was the way WebsByTodd was hosting client pages and encouraging clients to use GitHub for free commercial webhosting. GitHub pages are not intended to be used as a free commercial webhosting service. We hope you continue to use GitHub to build sites and educate others about web development, though. Your how-to pages are fantastic. We have unflagged your account so you are able to make changes. Please make them within a week, and feel free to ask us if you have any questions. We really appreciate your willingness to work with us to make certain you are in compliance and again, we are very sorry for the delay in our response. I picture a group of guys in suits sitting around a table in a conference room discussing the issues raised by “Webs by Todd”. That’s an exciting thought! Little ol’ me causing ripples in the corporate pond. (I’m sure it was more like an email between 2 guys in shorts but whatever). So last week’s issues with GitHub coincided with my exploration of CloudCannon. CloudCannon resembles something I want to be a part of and it solves some unique problems my clients have been having. I might go into more detail on this later, but for now it’s only worth noting that most of my client’s sites are being hosted on CloudCannon which syncs with BitBucket, DropBox, and GitHub.